AMC’s The Walking Dead season eight episode six left off with Daryl, Tara, Rosita, and Michonne going rogue and deciding to attack the Sanctuary. The episode came to a close with Rick (Andrew Lincoln) locked up inside a cargo container by Jadis and the Scavengers. Season eight episode seven titled “Time for After” begins with Rick alone and sweating inside the container. The door opens and it’s revealed Rick’s only wearing his boxers and his hands are tied. He reminds them all it’s not too late to join them. Jadis (Pollyanna McIntosh) takes Rick’s photo as one of the Scavengers draws his picture. Jadis reveals the pictures will be used to sculpt him “after.” She doesn’t explain what she means by after, but it sounds ominous. 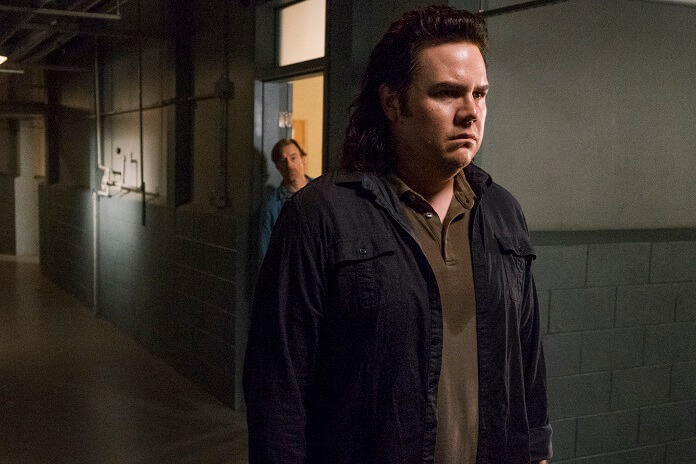 Back at the Sanctuary, Eugene (Josh McDermitt) makes a list of what he knows and doesn’t know. He closes the notepad before he writes down a single item. He then visits with Dwight (Austin Amelio), acknowledging he knows Dwight is the traitor. He also reveals Negan’s charged him with finding the traitor. If Dwight stops, Eugene promises he won’t give away his secret. Dwight explains that the Saviors and Negan are done. Supplies are running low, the workers are scared, and if Eugene just lets everything play out, he’ll come out on the winning side. If not, then Eugene will have blood on his hands. Eugene claims he just wants to be safe and it doesn’t appear he’s changing his mind about supporting Negan. Still, he won’t tell Negan about Dwight if Dwight doesn’t make it so that anyone left in the building is harmed. Eugene heads downstairs where hundreds of walkers are attempting to get in. A Savior tells him she believes they’ll make it through into the building in no more than a day or two. Next, Dr. Carson tells Eugene that Father Gabriel only has a few days left unless they get medication. Eugene understands why Father Gabriel was part of the attack on the complex, but he doesn’t forgive him for it. The doctor makes Eugene stay with his “friend” while he looks for anything that could help Father Gabriel. Father Gabriel (Seth Gilliam) can barely speak and Eugene compares his physical state to that of a potato and sh*t casserole. It’s obvious Father Gabriel’s in bad shape, but he once again asks Eugene to help him get Dr. Carson out of the Sanctuary. Eugene reminds him he doesn’t stick his neck out for anyone, but Father Gabriel wants him to do the right thing. Eugene, however, isn’t sure what the definition of the right thing is. Eugene doesn’t have faith in God or that there’s a bigger plan. Father Gabriel says it’s not difficult to believe Eugene will know what the right thing to do is when the time comes. He believes he’ll act appropriately at the right time. 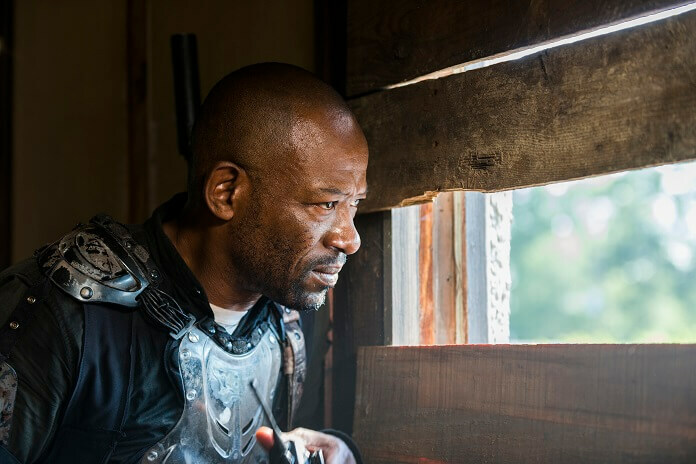 Morgan (Lennie James) scopes out the walkers outside the Sanctuary, in contact via radio with other snipers. They realize the truck that’s just pulled up is one of theirs. Tonya visits Eugene’s room, asking if he fixed her boombox. He can’t believe she’s worried about that, but she wants her music. Their deal was for two bottles of liquor when the repair was completed, but he asks for the second bottle in advance. He claims he needs it to sleep. Tonya reminds him he could have made this place better when he first arrived, but instead he only took care of himself. She gives him the bottle, telling him it won’t help him sleep. Daryl (Norman Reedus) wants Tara (Alanna Masterson), Rosita (Christian Serratos), and Michonne (Danai Gurira) to cover him while he crashes the truck into the Sanctuary. The walkers will then be able to enter the building and attack the Saviors. There are no more big weapons housed in the Saviors’ building, so they believe they’ll be okay. Morgan walks up and says he and the other snipers will have their backs. They have a debate over whether to act now or follow Rick’s plans. Tara is upset that she waited once before, but Rosita still believes in Rick. She leaves the group, but not before making sure Michonne is good with this decision. Rosita believes they need to wait, but it appears the rest of the team are dead set on crashing into the building. Negan (Jeffrey Dean Morgan) sits alone in the meeting room. He motions Eugene in and assures him he doesn’t want to let the Saviors die, even though he knows he will survive. Negan recognizes that Eugene is smart, and he wants to make sure Eugene knows he knows that. He offers Eugene his hand and Eugene goes to kiss it. Negan snatches it away, saying he was only offering it for a handshake. He reminds Eugene he doesn’t shake hands often as it’s a sign of mutual respect. Back in his bedroom, Eugene works on the boombox, staring at its speaker. He heads down to a storage area as he looks for parts. He spots Sasha’s coffin and pauses for a moment, emotional, before opening it to retrieve her iPod. Morgan watches as Daryl, Michonne, and Tara drive the truck closer to the Sanctuary. Morgan tells Daryl to cut the engine so he won’t draw the walkers’ attention. Michonne doesn’t look completely committed to this plan, and she suggests to Daryl that maybe they should trust the old plan will keep working. She doesn’t think this new plan is worth risking them. Daryl replies, “It is for me.” Michonne tells him she hopes it works but that she can’t do it. Tara is still on board as are the four snipers, but Michonne leaves. Eugene has built a remote-control airplane and he’s going to use it to play music and lead the walkers away. He makes a recording of what he’s doing, positive he’ll be successful. Just as he’s about to launch it, Dwight sneaks up and tells him not to turn around. Tara gets into position and Morgan’s snipers are ready for Daryl and his truck. Dwight tells Eugene to back away from the airplane. Eugene can’t believe Dwight would kill everyone inside the building. Dwight reminds him it means Negan will kill Rick and all the others, if Eugene launches this plane. Dwight says they’re just traveling companions and not friends so he’s okay with that. Eugene doesn’t believe Negan can be killed by anyone, and he has the remote control ready to push to launch. Dwight continues to point the gun at Eugene’s head, but he allows him to launch the plane and doesn’t shoot. The plane soars over the walkers. Daryl drives the truck toward the building as Dwight shoots the plane out of the air. Outside the fence, the snipers and Tara begin firing into the building to cover for Daryl. Daryl rolls out of the truck as the truck smashes into the building. Daryl and Tara escape while the walkers pour into the Sanctuary. The Saviors shoot the walkers but there are too many of them. They flee into the upper levels as the walkers continue to make their way inside. Eugene watches as it happens, completely stunned. Even Dwight shoots at the walkers as they begin feasting on the Saviors. Eugene charges into Father Gabriel’s room and tells him he’s not on board with helping Dr. Carson escape. He goes off on a rant, saying he will survive and he will help Negan. He’ll turn in traitors and do whatever he has to do to live. Eugene meets with Negan and tells him he needs his machines back to make more ammunition to save the Sanctuary. Negan reminds him that when he gets free of this mess, he’ll dump a sh*tstorm on Rick. Eugene’s okay with that and in fact feels great that he can help Negan and the Saviors. Eugene is about to reveal Dwight is the traitor when a few Saviors arrive, including Dwight. Negan tells them Eugene has solved this mess and instead of revealing Dwight as the traitor, Eugene says he can fix the intercom system to help with communications. Rick’s let out of the cargo container and he’s walked into the center of the Scavengers’ compound. He’s forced to kneel as a walker is led out by Jadis. She says, “Time for After,” and Rick springs into action. He attacks any Scavengers who enter the area and uses the walker as a weapon. He finally removes the walker’s head and attacks Jadis. Rick is able to get Jadis’ gun away from her and then he’s surrounded by Scavengers. Holding Jadis inches from the walker’s mouth, he reiterates that he is leaving. However, he warns them his people will return to kill them all. He suggests that after he leaves, they all run. Jadis instructs her people to lower their weapons. Rick leans in and asks Jadis, “We done?” She agrees, and he helps her to stand. She asks what will happen if she joins them. He explains the Sanctuary is surrounded by walkers and when the time comes, the Saviors will surrender to his group. He will then kill Negan himself. She agrees, but wants him to pose naked for a sculpture after it’s all done as part of the deal. Rick refuses that demand and they finally settle on the Scavengers getting a fourth of the Saviors’ property when it’s all done. Rick arrives with the Scavengers a distance from the Sanctuary to find walkers eating people. The snipers don’t answer when he calls them on the walkie-talkie, so he climbs the water tower. He’s shocked to see a hole in the side of the Sanctuary and realizes the walkers have all entered the building.